More videos found on YouTube that demonstrate ways humans can touch rats who like to be touched, to enhance the rat-human bond. Here's sweet Myst enjoying being scritched and showing us with her bruxing and boggling. Those Aussie rats know how to boggle right. Next, Jacky has his human well trained to give perfect scritches. Doesn't this rat seem to soak in the grooming? I confess, I might have a fetish over tail-flicking. Here is Squints doing his thing. Ratley, says his human had a hard day - ? I think this is the ultimate in trust. This rat thinks the human is just another rat. Last on this page is Geten. He and his tail-flicking steal my heart completely. If you are viewing this from the keywords page, click to go to the gallery and view many pages of embedded youtube videos I have stumbled across. 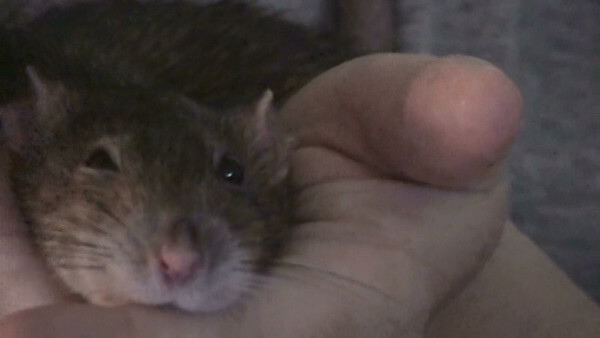 They demonstrate great qualities of rats and trust training techniques.